Primary Natural Resources forest products, fish, marine products, deep sea minerals. 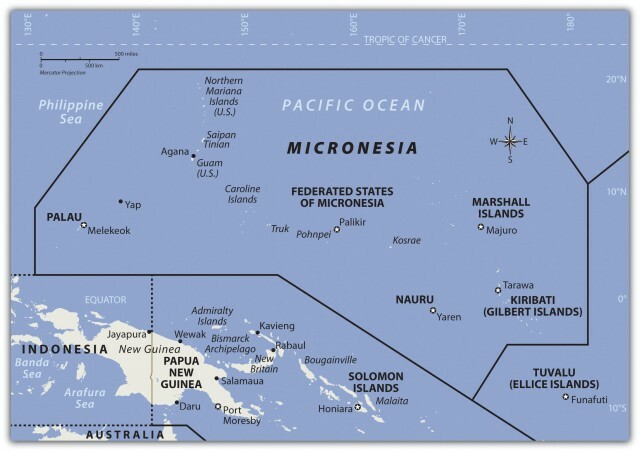 MICRONESIA CONSISTS of four Pacific island groups located between the Marianas and MARSHALL ISLANDS, 1,000 mi (1,600 km) north of PAPUA NEW GUINEA and some 3,000 mi (4,500 km) west of HAWAII. Although they cover an expanse of ocean larger than Western Europe, the total land mass of the 607 islands in the four groups is approximately that of a mediumsize city. A stone fortress built on a reef at Nan Madol gives evidence of advanced human occupation by 500 C.E. Discovered by Spanish explorers in the early 16th century, the islands of Micronesia were originally called New Philippines but were renamed the Caroline Islands around 1700. 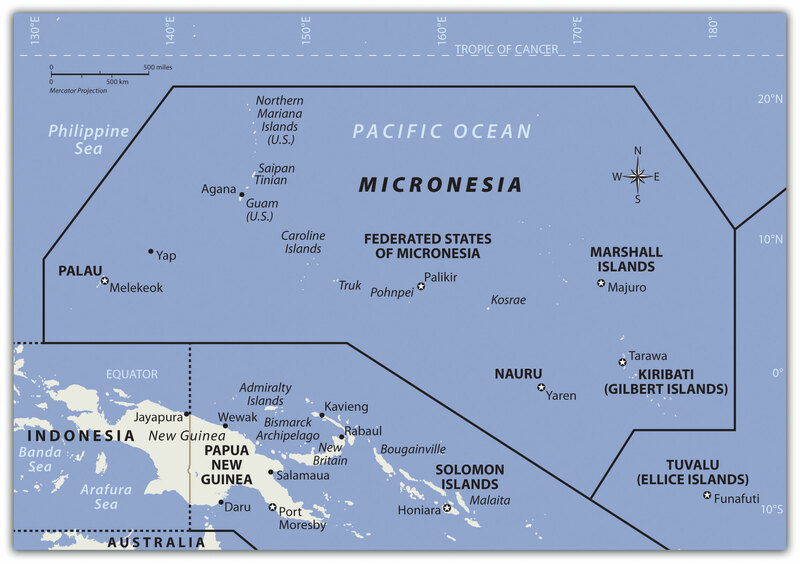 Micronesia’s islands include the high volcanic groups around Pohnpei, Kosrae, and Chuuk (Truk), as well as those around Yap, which are part of a raised section of the Asian continental shelf. All have tropical climates, abundant rainfall, and sparse populations. Pohnpei is a rocky, circular island with steep cliffs, tropical jungles, and extensive mangrove swamps. Kosrae is a solitary island with few outlying islets, and is encircled by a large coral reef. Chuuk includes 15 large islands, 192 outer islands, and 80 islets and atolls, with a total population of 50,000 people. Yap includes four main islands and 10 islets within the bounds of a large coral reef and 130 outer islands. European colonial powers became interested in the islands in the early 19th century when whaling vessels began operating in the South Pacific. Westerners brought new languages, new religions, and new illnesses. A smallpox epidemic in 1854 killed half of Pohnpei’s native population. In 1899, GERMANY purchased most of the Micronesian islands from SPAIN, but lost them to JAPAN, which seized them in World War I. In December 1941, Japan used its outposts in Micronesia to launch attacks on nearby islands, including Guam. The UNITED STATES oversaw the islands after World War II, and sponsored their transition to independence in 1991. Micronesia’s islands have no native mammals, but they do support a large array of marine and plant life, birds, and insects. The islands have one of the most uniform year-round temperatures in the world, at 81 degrees F (27 degrees C).